I bought some organic chicken thighs on sale and thought about cooking the tried and true ginger chicken for tonight’s dinner. But when it came time for cooking, I wanted to try something new instead. Boy am I glad I did! Viet cooking combines more layers of flavor, and this is definitely one that is worth trying! Marinate chicken in a mixture of honey, salt, pepper, sugar, garlic, oil, cornstarch, scallions, lemon or lime juice, fish sauce and oyster sauce. Set aside for 15 minutes. 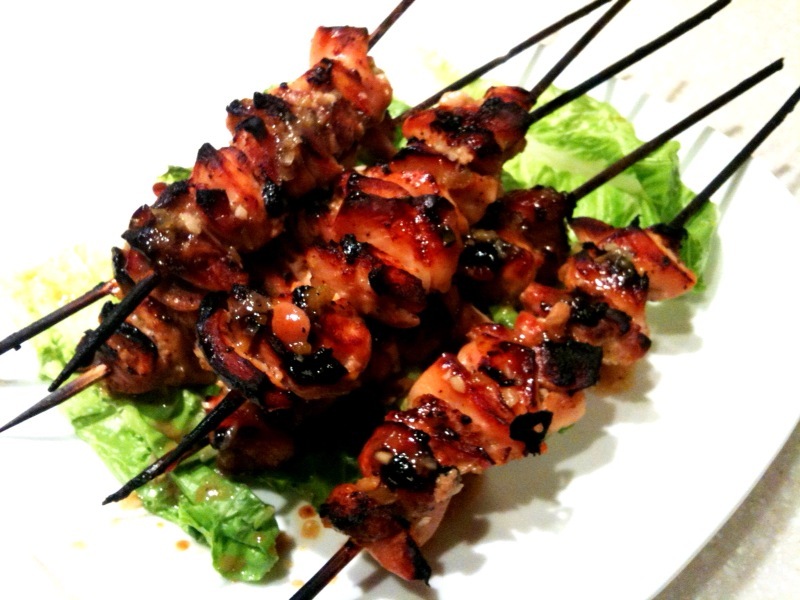 Thread marinated chicken onto skewers, leaving two inches free at each end and place on a baking sheet. Heat oven to 375 degrees and bake about 20 minutes until chicken is medium-rare, then flip to the other side for another 5 minutes. Turn oven to broil and broil chicken until brown (about 3-4 minutes). Do not overcook. Serves 4. I actually gave this a try last night! Unfortunately I wans’t able to get the chicken to look like yours! 😦 I really liked the color that yours turned out. Instead mine was still white. But it was super flavorful, and I enjoyed it! I did set my oven to Broil, hoping that it will get the red, and a little bit of burn, but didn’t happen.. Although I did make a couple of variations: I used chicken breast (as opposed to thighs).. While I’m a dark-meat person, I had some spare white meat to use up. I wonder if this is why mine turned out to be white/colorless? Also, I added a little bit of lemongrass for a little extra flavor. I also used a “toaster oven”, as opposed to a conventional oven. I may have overcooked it now that I think of it. I think you and I both know (as food bloggers) that cooking times (and temperatures) vary from oven to oven, so I may just need to find an optimal temperature that works with my oven. That’s interesting about the color variation, I remember before the broiler, the chicken was still in more of of a pale shade, after the broiler did it’s job, that’s when the brown color and the little bit of burnt showed up. Good to hear the flavor was good, and I bet the lemongrass made it even more flavorful! I see, so it was pale before putting it to broil. Yes, it really was flavorful! Thanks again! i made this dish tonight for dinner. so far, this is the 2nd recipe i have tried. love this dish. yes, very flavorful. it was my first time ever using fish sauce. hey, what rack did you put the baking sheet on … the middle rack or maybe you put it on the very top rack? I cook this dish quite a bit, the family always eat it up! Though ever since I switched out my oven, the broiling function doesn’t work the same as the old one, so the color is never as pretty as the one posted here. Bummer!